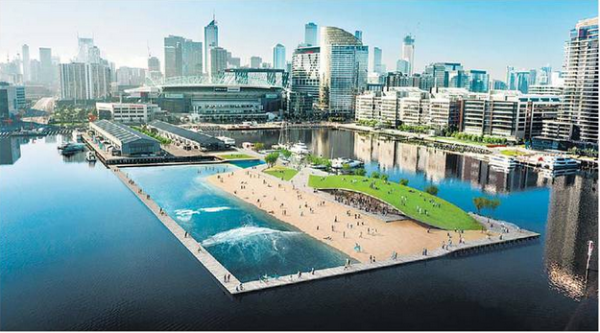 Melbourne will be the first world city to have floating surf park. Two Architect firms are working on this. Very soon they will present such a park to the citizens. The city will be a trend setter and a heaven for those who are into water sports and outdoor activities. The surf park within the harbor is safer than sea surfing. The surfer will have more fun and challenges as the waves would be controllable. Different waves for different group such as for the youngster, the beginners and expert surfer.The artificial waves would be adjustable: as little wavelets that is; small swell for the youngsters and the beginners. For the experienced, the waves could be as high as five feet and surf 30 meters wide up to 160 meters length. Kayaking is another water sport, and an exciting beach soccer would be very interesting to have fun all the way. Apart from the learning and entertaining for most people the surf park will hold competitions to keep the interest of the sporting community. The beach lifestyle would be there right in the middle of the city. There are many opportunities to plan and make the park a reality in the near future. Australians are excited for the prospects and eagerly looking forward to the venture of 172,222 square-foot of the park that will be a source of much joy for one and all. The park will have a broad sandy sea beach; a soccer field, a cafe, an enormous garden, large pool and shopping malls. The visitors can swim in a safe environment in the heated seawater, entirely filtered, throughout the year. The shops are planned to go beneath the sprawling lawns for all sorts of tourist stuff.